This curious gray whale was just as interested in a friendly encounter with these tourists as they were with him. Having a gray whale head come to the surface of the water right beside the little boat was a unique experience, and as this picture depicts, it seems the whale is seeking a unique human encounter or experience himself! 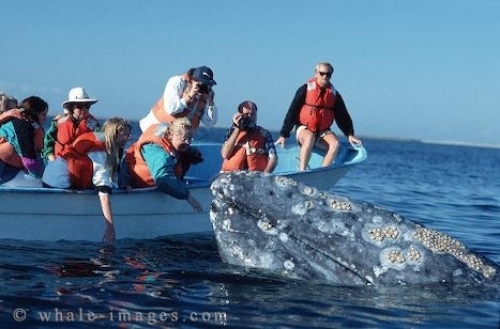 Picture of tourists touching a Gray Whale off the Baja California coast in Mexico.